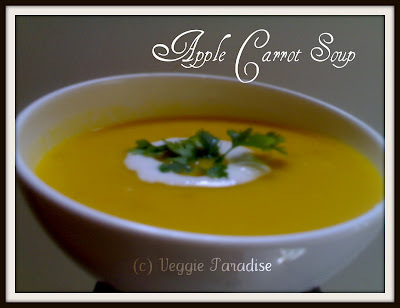 This is a sweet comforting soup with the combination of apple and carrot. Heat oil/butter in a pan, add the garlic and saute for a min. Add the chopped onions and saute them till they turn translucent. Now add the chopped apple and carrot. Saute for 2 mins. Now in the cooker , add the mixture along with the vegetable stock and allow it for 2 whistles. When the pressure is down, allow it to cool and blend them in a food processor. Transfer the puree to the pan , add salt and stir it gently in a medium flame, when the soup comes to boil, turn off the flame. Delicious Apple with carrot soup is ready to served....,..
WOW! A beautiful and healthy soup. Hope can share some please .. It looks beautiful. I like it. Wow such a nice combo for a soup. 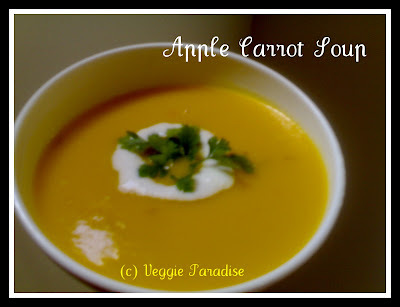 wow thats a beautiful colour and the click...so comforting & delicious...and a very happy ugadi aruna..
Apple Carrot Soup Sounds great!!! Dear.Looks creamy with nice click and also healthy version too.Wish You a Happy Ugadi!!! Aruna.Take Care and Keep Smiling. Nice combo .Looks healthy and delicious! hey aruna... how u doing??? me blog hopping after a long time!! truely an unusual comboo....but a lovely one!!! Lovely color, beautiful presentation. Soup looks yummy. well presented.. nice healthy combo.. Your Soup looks so thick and yummy. Very happy to see you visiting my blog. Unique combo but some friends posted to right ..looks so yummy and wish to try soon dear. thanks for sharing. Unique combo.I have never had this kind of soup.Yours look so tempting. I love the flavors in this! Beautiful! Very colorful and healthy soup. Loved the combo. That's an unusual combo. The soup looks nice and thick. Soup luks very healthy n tempting.